For having a very picturesque rockies summit, a beginner friendly trail, and an easily commutable jump-off point, it is not surprising that Mt. 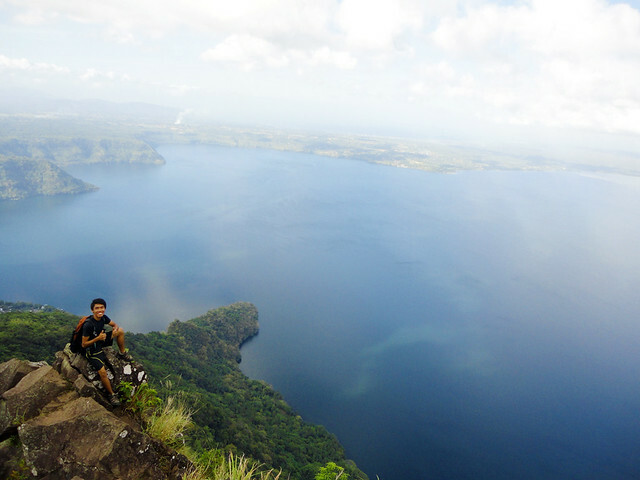 Maculot is one of the most frequently hiked Southern Tagalog Mountain. And because of this, its trail has become so used up that the locals have finally decided to open up a new trail. 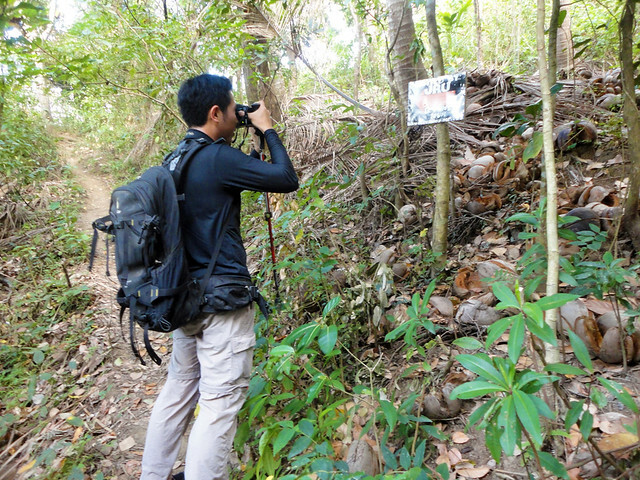 "A new trail in Maculot, where?" - this was the question that bugged my mind, and probably Doc Gideon's as well, when we heard that a new trail has now been opened in Mt. Maculot. 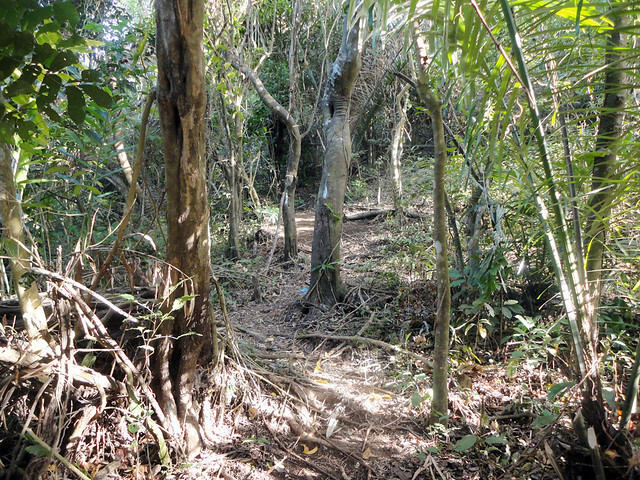 We became so curious with it that on the day that followed the night when we were just conversing about this new trail, we went to Cuenca, Batangas to check it out. Early in the morning, Doc Gideon and I went to Mt. Maculot for a quick hike via this new trail. At first, nothing seemed to be different. It was like the usual Mt. Maculot (rockies) dayhike, we registered on the same registration area for Maculot Rockies (registration fee remains at P10) then started the trek from Mountaineer Store. Wondering where we could find this new trail, we asked the people at the base of the mountain. All of them were saying, "just keep going, the very obvious trail signs leading to the new trail will not go unnoticed.."
Indeed, after trekking for like 10 minutes, we saw a number of signage with arrows posted all over the trail. We simply followed these arrows until a forking path was reached - to the right is the traditional rockies trail blocked by piles of branches, while the one to the left leads to the new trail. Relative to the old trail, the early parts of the new trail was a lot easier. Gradually ascending and has plenty of trees and branches to cling on. But as we go further, the terrain has turned too loose and steep, thus slippery. As for the distance, I guess they're almost the same. We noticed too that more spaces allotted for buko juice vendors and resting stations were created along the trail. I can smell business rolling in this new trail! 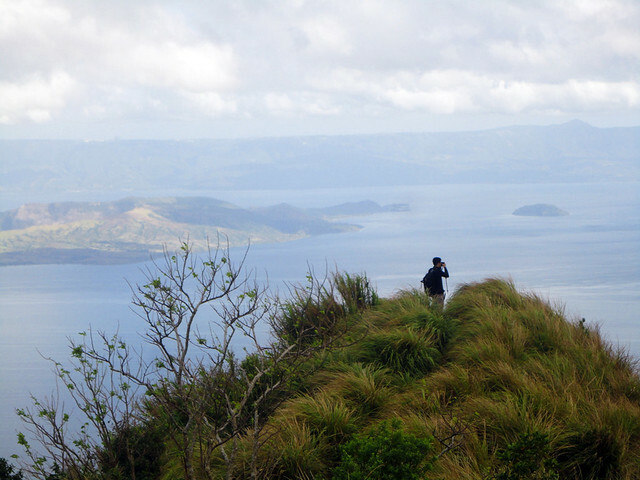 spacious resting stations to cater buko vendors and hikers that need rest badly. O diba parang pwede nang pag-dausan ng misa. 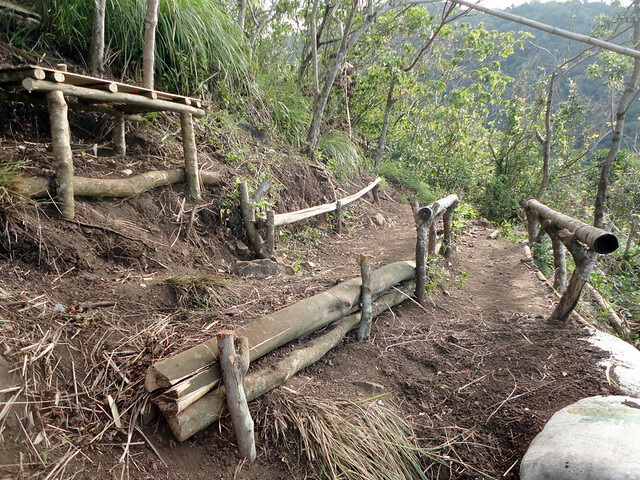 Somewhere at the talahiban area, after about an hour of trek, the new trail meets again with the old trail. From that spot, it only took three or five minutes before we finally reached the campsite area. Right away, we headed to the rockies, my favorite spot in Mt. Maculot. The must-see Rockies view deck of Mt. Maculot has never failed to wow me everytime I go to this side of the earth. Believe me, your Mt. 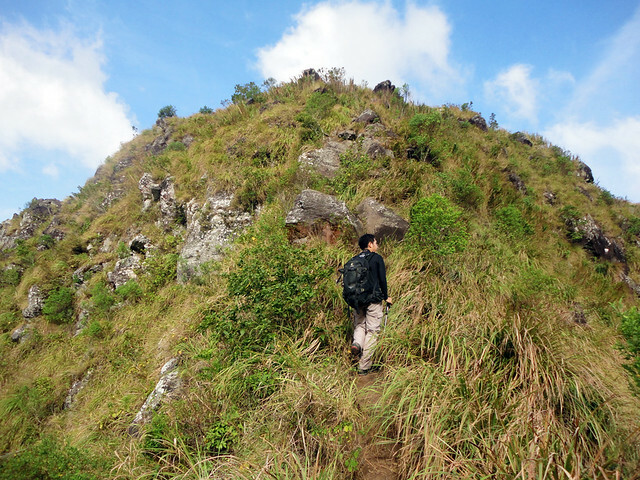 Maculot hike will never ever be complete without experiencing its rockies. Certainly a great reward that would make your weariness vanish in an instant. 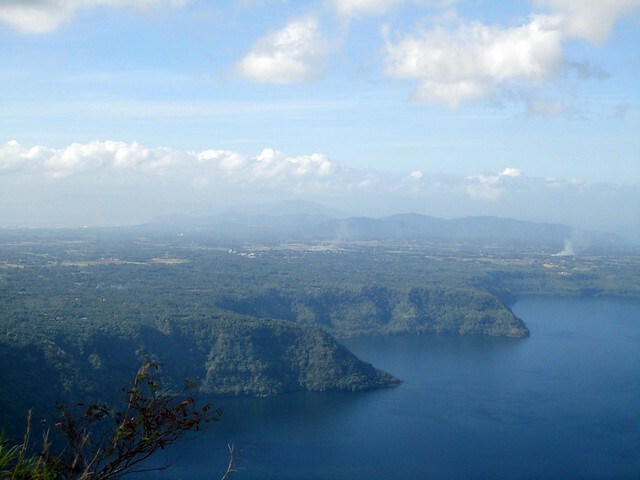 Taal Lake as seen from Mt. Maculot Rockies. that priceless smile brought by the view from the rockies. At around 9 AM, when hikers started to flock into the rockies, we decided to go down the mountain. It was quick, in less than half an hour, we're already back at the Mountaineer Store. Woohoo to my 3rd Mt. Maculot hike. ask q lng kung san mas advisable na trail pra sa new comers ng maculot? ung bagong trail or the old one? thanks in advance.. lagi aqng nagbabasa ng blog nyo ni sir gid, and cguro nga masa2bi ko ng im a fan of both of you. thanks again, sana magkita kita tau sa trail..
hndi ko pala na-mention. 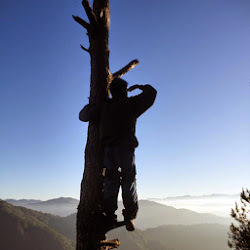 The locals have closed the old trail..
Ivan, I've read Darla Sauler post on Twitter.. bawal daw akyatin ang summit ng Mt. Maculot... hangang rockies lang.why is that so? Have you got an idea? It's not really bawal. It's just that the more convenient access to summit, which is from the Grotto Trail, is closed by the barangay; and actually there's nothing much to see there. You can still access the summit from the rockies though, through the connecting trail. Ivan.. I've read a comment on Twitter from Darla Sauler na dapat hanggang ROCKIES lang on Mt. Maculot.. why can't you not make it to the summit? I wonder if a mountaineer with a mountain bike can make it to the top. That would be an awesome picture! 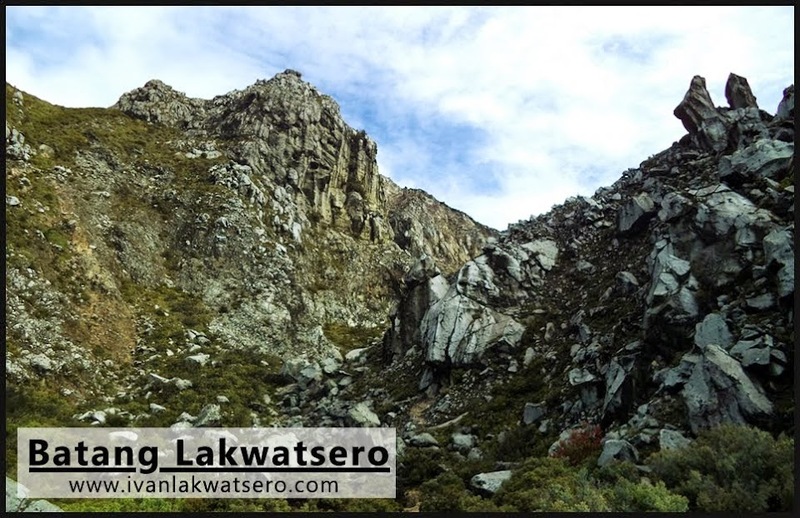 sir ivan, bawal na talaga mag traverse from grotto to rockies? how about rockies to grotto? how much po kya pa guide? akyat kami this weekend. tia! Good afternoon, how long is the hike? Hi Sir Ivan Good morning! Do you have Itinerary for this trek? from manila to there vice versa and also the budget? thanks! Sir, Pwede po ba mag overnight sa Mt.Maculot? Thanks!